Four UCF students traveled to Peru this summer to conduct science in the field. 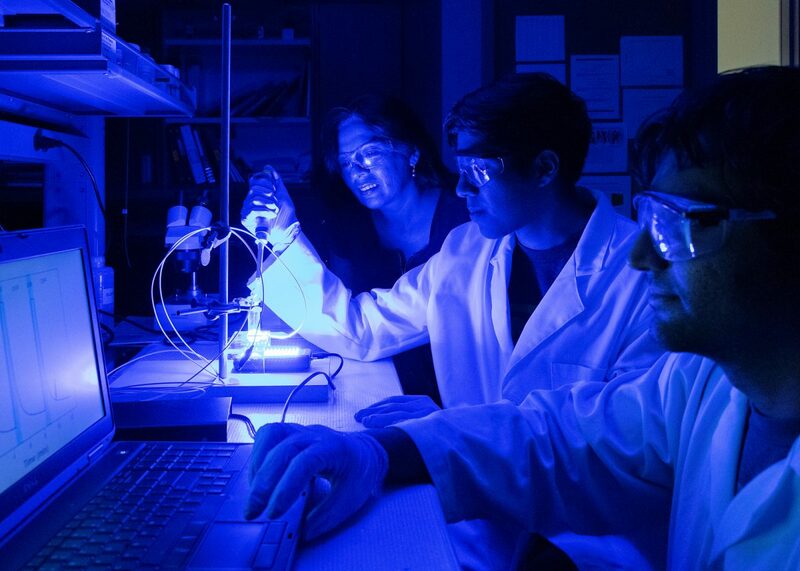 Chemistry Associate Professor Karin Chumbimuni Torres works with students from Peru in her lab. Carlos Salazar is wrapping up a month-long educational experience in one of UCF’s chemistry labs this week – and he says it has changed his life. Salazar is one of a handful of students from his country who spent 30 days in the pilot program funded through grants from the nonprofit organizations Partners of the America and 100,000 Strong in the Americas. Associate Professor of chemistry Karin Chumbimuni Torres is responsible for putting the program together. The grant allowed Torres to take four UCF chemistry students to Peru this summer to conduct science in the field and then host four Peruvian students at UCF. The students, who traveled to Lima to attend a conference, worked in labs at the National University of Engineering. They also worked with elementary school students on a hands-on chemistry project. Those visiting UCF worked in one of three chemistry labs, attended workshops and held an outreach program for middle school students at a Seminole County public library during their visit. 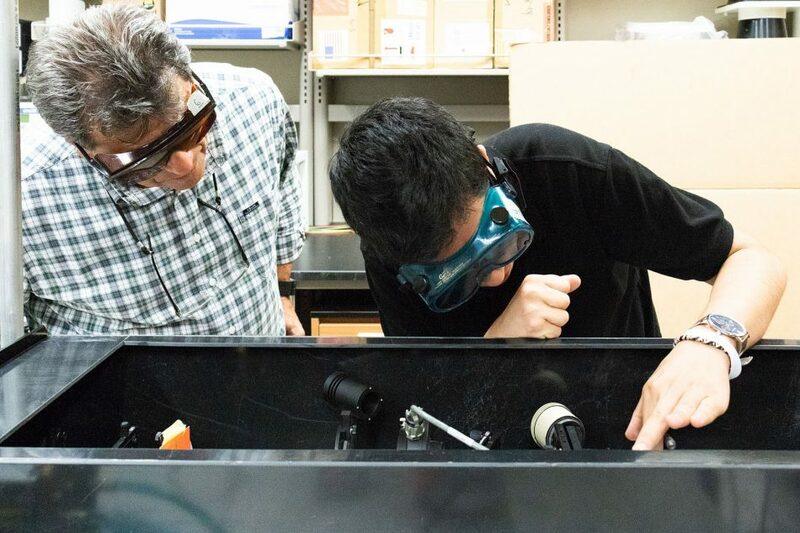 Torres and fellow chemistry professors Andres Campiglia, Fernando Uribe-Romo and Florencio Eloy Hernandez are collaborating on the program and are eager to see it continue because of the impact it is making on students. UCF Global also supports the effort. Salazar, a senior working in Hernandez’s lab, expects to graduate in May with a degree in chemistry. Classmate Julio Ojeda also traveled to UCF from Peru and has been working with Campiglia and his graduate and undergraduate students. They are using spectral analysis to determine what carcinogens are present in sediment found in the Gulf of Mexico following the Deepwater Horizon oil spill. The spill in 2010 dumped more than 200 million gallons of petroleum into the gulf. Julio Ojeda and Professor Andres Campiglia work together at UCF. For Ojeda, the 30 days in the lab has given him a confidence boost. That’s just what Torres wanted. When she applied for the grant, her hope was to open a pipeline to South America so that qualified chemistry students might come to the United State, specifically UCF, to complete their graduate degrees and then return home to become ambassadors for higher education and how it can change your life. She knows it is true, because it happened to her. Torres was born and raised in a poor region of Peru. She attended a charter school funded by a German philanthropist, which prepared her for college. She was among the top 10 percent in her class and was able to complete graduate school and post-doctoral work at the University of Campinas in Brazil, the University of California at San Diego and Purdue University in the areas of chemistry and nanoengineering. There are so many benefits and not just for students abroad, Torres says. “Our students also get to see how science is conducted in another country, sometimes with less resources. That can lead to interesting approaches to solving a problem,” she says. Cody Autrey, a third-year UCF student studying biomedical sciences, says the trip to Peru this summer was enlightening. He not only conducted research in a lab in Lima, but he attended a chemistry conference and completed outreach to elementary-age children in Lima. 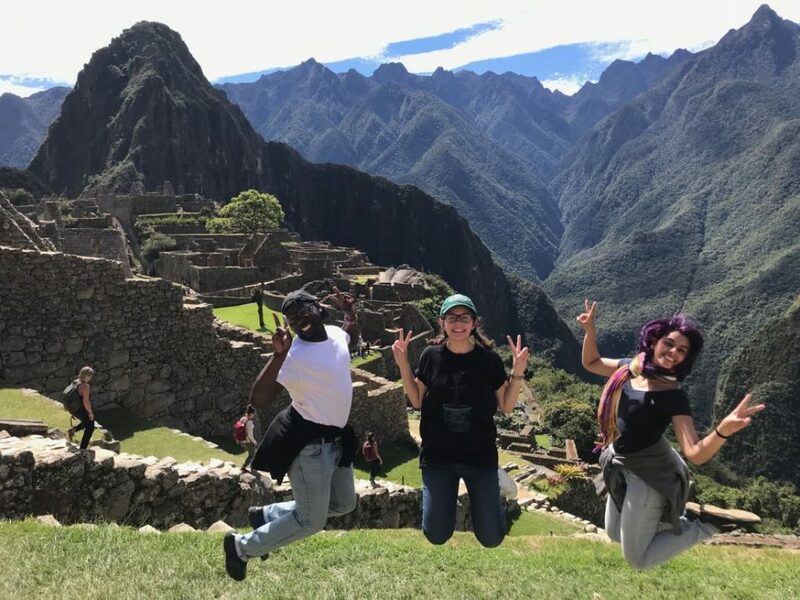 Andrea Bances-Monard, Caterina Vadell and Rondell Thorpe enjoy some sightseeing during their chemistry exchange in Peru. Autrey says the lab he worked in wasn’t as stocked as UCF’s labs. Other students involved in the pilot program are: Gabriel Cerron from National University of Engineering in Peru, who will join Uribe-Romo’s lab next semester for 30 days, and Andrea Bances-Monard, Caterina Vadell and Rondell Thorpe from UCF who traveled to Lima with Autrey.